For those of you who do own polarized sunglasses, you know what a valuable resource they can be. For those of you who don’t, you are missing out on a great tool to catch bass fish. First, the idea of polarizing lenses is not a new concept. It has been around for nearly two decades. Until recently, however, it was only applied to high-end riflescopes, binoculars, and camera optics. This is due primarily to the fact that up until now the process of polarizing a lens was very costly and time-consuming. Along with the advances in the field of optics, it has become practical and worthwhile to apply this polarization process to sunglasses and in some cases prescription eyeglasses. Polarization by definition means that: the glass is treated by aligning the molecules in the glass in one direction, which eliminates the refraction of light and drastically reduces visible glare. It’s in this reduction of glare that produces the effect of “seeing through the water”. By removing the surface glare, the wearer gets a clearer picture and a wider field of vision on and under the water. Of course, the lighting conditions on any given day will determine exactly how effective the glasses are. The sun directly overhead provides the wearer with the best possible results with these glasses. Most of the light is directed upwards and not on an angle where it would shine directly at the lens, such as during sunrise or sunset. Like any other product, quality comes at a price. The cost of these polarized sunglasses can run anywhere from ten to fifteen dollars for Wal-Mart discount rack types, upwards of three hundred dollars for premium optics and designer names. I like to designate them into four categories: Low End, Lower Mid Price, Upper Mid Price, and High End. Each of these categories has their pros and cons. Low End: Lower end polarized glasses can usually be found on either discount racks at Wal-Mart type stores or in the discount section of outdoor catalogs such as Bass Pro Shops. Although the packaging may say polarized, chances are that for ten to fifteen dollars they aren’t. Rather, they are regular lenses with an anti-reflecting or anti-glare layer of cellophane. This gives the illusion of being polarized and in many cases does offer some of the features of having polarized lenses. However, there are two major pitfalls of units in this price range. Number one: there are usually limited styles. Number two: the cellophane coating on the lens has a nasty habit of peeling up or bubbling after a few months of use. Use in heat can speed up this peeling and bubbling as well. Lower Mid Price: Units in this category usually fall somewhere between twenty to forty dollars and offer several significant improvements over their low-end competitors. First major improvement and possibly the most important is that in most cases the lenses are actually polarized. There is no cellophane or film on the lens rather it is treated when the lens is formed. The next major improvement lies in the fact that there are far more styles in this category. Quite possibly the best deal in this category comes in the “store brand” glasses that Cabellas or Bass Pro Shops offer. They are well made, have polarized glass, and in many cases offer attractive styling. Another nice deal in this category is the Remington/Stren Fisherman sunglasses. They offer a wrap-around design, as well as interchangeable lenses. The set comes with two different lenses, one smoke colored and the other in an amber color. This allows the user to select the proper tint for the lighting conditions on any given day. I have owned these before and I will attest that for the price, you will receive a very unique and functional product. Upper Mid Priced: Those units falling under this category usually range from fifty to one hundred dollars. Undoubtedly most of the good deals on this type of product fall somewhere in here. Here is where one will usually find the best product for the money. In this category, all the glass is always polarized as it is formed, and will sometimes offer a non-scratch coating. Also in this category look for metal components such as hinges. Sometimes, glasses in the price range might offer extras like a cleaning kit or a “croakie”. Another bonus to this category is that nearly all the current styles will be offered and in many cases can double as “off the water” sunglasses as well. A great producer of glasses in this category is Costa-Del-Mar. They offer great styles as well as a truly incredible lens, which in many cases puts high-end models to shame. As of now, I own the Costa-Del-Mar Ex-Frame model, and needless to say, I am absolutely thrilled with them. I also wouldn’t trade them for any other brand. They are extremely comfortable and in driving situations, actually cut the glare from shiny pavement surfaces as well. This is a nice feature when driving into the blinding sun. As far as on the water performance, they offer everything a buyer could want in a pair of fishing sunglasses as well as serve as eye protection when running up or down the lake at full speed. High End: The glasses in this category normally range upwards of a hundred dollars and usually are from a designer name. There is very little I could justify for paying more than a hundred dollars for a pair of sunglasses when the upper mid price units offer all you could ever need and more. Runway designers such as Calvin Kline or Versache do produce several lines of sun protective eyewear that are polarized and are considered for “sports use”. These designers could run upwards of three hundred dollars. 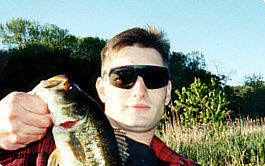 A bitter irony is that many of the upper mid-priced models are specifically designed for fishing and water sports, and come with a better polarization treatment than do the designer sports glasses which are usually designed for “general outdoor use”. There is, however, some high-end glasses produced specifically for fishing that are retailing above the three-figure range. One of these is Ocean Wave sunglasses which are a similar design to Costa Del Mar but feature an exclusive “mirror blue” feature which is said to cut nearly 100% of surface glare. Also, it should be mentioned that on certain upper mid-priced models that added features could drive up the price, like mirrored lenses. For instance, a pair of Costa Del Mar glasses with smoke finish might retail for $99.99 but add mirrored or specialty lenses, and you’re looking at $149.99. It should be noted that mirroring a lens does tend to cut a little more glare away but is usually more for cosmetic and appearance than anything else. A good way to attempt purchasing your eyewear is to evaluate your needs and then go on looking from there. Unless you know exactly what you want, I would stay away from mail order catalogs and stick with retailers or sporting goods stores. At least you have the chance to touch them and try them on. Also, be sure of your retailer’s return policy, in case you wish to return your purchase after you give them a shot on the water. It’s not uncommon to have to try two or three pairs to finally settle on one pair you are truly comfortable with. Remember, it’s best to consider your sunglasses another piece of fishing tackle, and not something that’s to be taken lightly. Oddly, a fisher-person who is willing to spend two hundred dollars on a reel gives you a look of utter disgust when you suggest to them to spend half that on something such as shades. They fail to realize that they will protect their eyes from harmful UV light, act as eye protection at high speeds in a boat, as well as help them to see structure and fish they would otherwise have missed. With that in mind, perhaps it’s time to evaluate your sun protective eyewear and consider it’s many functions.